The pro-Khalistan rally, allegedly backed by a few quarters in Pakistan and organised by the US-based Sikhs for Justice, witnessed about 2,500 supporters who demanded a referendum in 2020 for a separate Sikh nation. 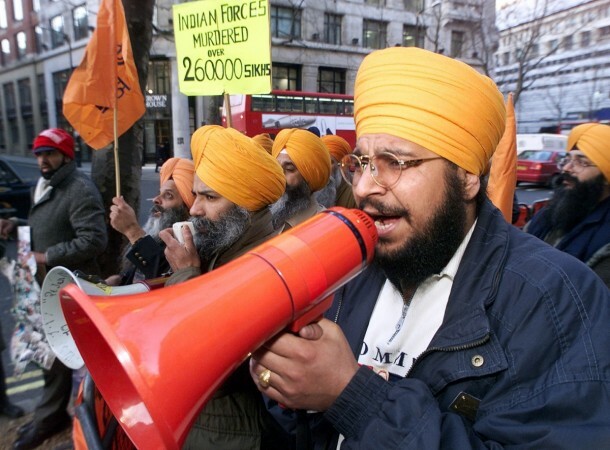 The pro-Khalistan rally, organised at London's Trafalgar Square, created quite some buzz beforehand. But when the Khalistan supporters actually took to the streets on Sunday, August 12, they were reportedly overshadowed by India supporters, who came out in huge numbers to counter them. The rally, allegedly backed by a few quarters in Pakistan and organised by the US-based Sikhs for Justice, witnessed about 2,500 supporters who demanded a referendum in 2020 for a separate Sikh nation. 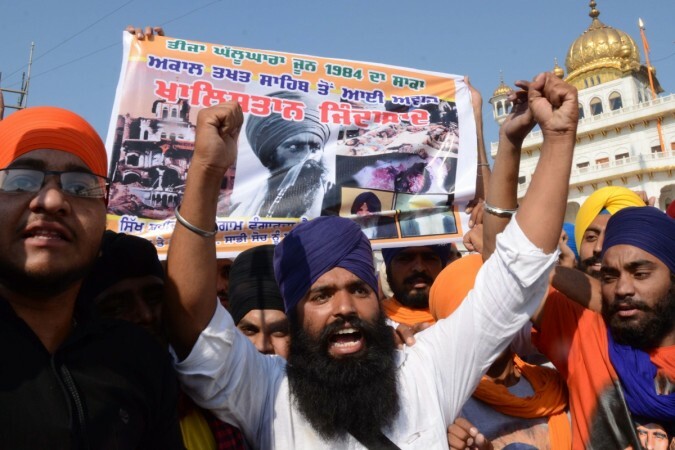 Demonstrators waved flags and chanted slogans such as "Khalistan Zindabad" (long live Khalistan) during the rally, for which supporters are said to be travelled from various places in Europe and other parts of the world. Speaking at the rally, British-Pakistani, Lord Nazir Ahmed said that he was in favour of separating Punjab from India. "I believe in Khalistan for my Sikh brothers and sisters," the Hindu Business Line quoted him as saying, which gives away clear hints at how the idea of Khalistan is backed by Pakistan. Ahmed was earlier in the Labour Party, but was thrown out for his indiscipline and political views. Meanwhile, Ahmed isn't the only parliamentarian speaking in favour of Khalistan. Caroline Lucas, leader of the Green Party, and Matt Western, Labour MP have also supported a separate nation for Punjabis. Like them, Garbaksish, a young protestor from Birmingham also added: "We want to take back Punjab." The event at Trafalgar also saw the presence of organiser and New York-based lawyer Gurpatwant Singh Pannun, who is known to have close ties with Sikh extremists Jagtar Singh Tara of Khalistan Tiger Force and UK-based Paramjit Singh Pamma. However, Pannun's participation drew quite some ire even from Sikh separatists like Jaswant Singh Thekedar, who said that he was acting on behalf of Pakistan. "No religious Sikh leader has participated in the event. Pannun was making publicity of this event for the past two years and spent huge amount of money. They hired TV and radio stations for the publicity. We believe Pakistan has spent entire money for this publicity. These Sikhs are mostly enjoying Pakistan's patronage and we do not support their cause," ANI quoted Thekedar as saying. "The Referendum 2020 is totally unlawful and the voting will have no relevance," he added. While pro-Khalistan demonstrators raised slogans, a lot of it was drowned by India supporters who came out to counter the event. Around 200 people attended a pro-India rally and were seen with placards that said: "Sikhs for a United India" and "We stand for one united strong India." Demonstrators said that the number of people at the rally did not matter and the point they were trying to put across was that the diaspora in UK stood united with India. "We want to show the unity of India, it is a country for all religions and in our diversity we are stronger," BL quoted Bharathi, from London, as saying. The group also raised pro-India slogans, held up posters with PM Modi's image on it, sang patriotic songs and danced to the tunes of the dhol. Meanwhile, the brain behind the "Referendum 2020," a movement started by radical Sikhs in Europe and Canada, is said to be Pakistan Army's Lieutenant Colonel Shahid Mehmood Malhi. Often referred to as Chaudhary Sahib, he headed ISI's Lahore detachment, which often makes news for its Punjab-centric activities. The intel also believes that Malhi's detachment could have had a role in the Pathankot airbase attack in January 2016.